What is Serious Nutrition Solutions RK-500 Xtreme? Welcome to our SNS RK-500 Xtreme review. This is a weight loss dietary supplement that aims to help burn fat faster by boosting the body’s metabolism. It also helps boost stamina and improve the body’s immune system to prevent ailments. If you are interested in this weight loss product please continue reading our in-depth review. This is a weight loss dietary supplement that utilizes natural ingredients in order to deliver a relatively safe alternative to other weight loss supplements. It contains only one primary ingredient which is raspberry ketone extract. Raspberry ketones are known for having weight loss properties by increasing the body’s metabolism, which in turn, helps burn fat quicker. The recommended adult dosage for this dietary supplement is 1 to 3 times per day; 1 capsule 30 minutes before each meal. Ideally, it should be taken once during breakfast and another during lunch. Do not take this supplement at night as it has certain effects that will most likely make you restless during the evening and you may have a hard time falling asleep. 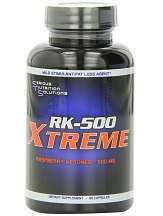 The SNS RK-500 Xtreme is available for $28.95 for every 90 capsule bottle. However, this product is not offered with any sort of special discounts for bulk purchases or monthly supply packages. While the price is not exuberantly high, it will take its toll on your budget in the long run as you will be paying full price for each bottle no matter how many you buy in one go. While raspberry ketone extracts are relatively safe to take orally, it should be noted that exceeding the recommended dosage might be harmful to your health. Common side effects that might occur include increased heart rate, higher blood pressure, and jittering. Make sure you follow the instructions on the bottle to avoid these side effects from occurring. It is also important to state that pregnant women, people who are under the age of 18 and those who are undergoing certain medical conditions should first consult their doctor before trying out any type of medication or dietary supplement. SNS RK-500 Xtreme does not come with any customer guarantee which is a little bit of cause for concern. We say this as the product itself does not have enough customer reviews online to back up its effectiveness. The SNS RK-500 Xtreme contains a higher dose of ketone extract which translates to faster results. That being said, each bottle is quite expensive and there is not customer guarantee offered if you are not happy with the product. The higher dosage of ketones also means that you should be more careful in taking this product as side effects are more likely to occur if the proper dosage is not followed.